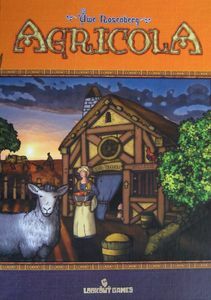 Agricola PriceCompare, Buy this board game at the Lowest Price. As the name suggests, the game is about farming. Players have land and a couple of family members, and attempt over the course of the game to build their farm to be the most successful. Interestingly, "most successful" is measured across THIRTEEN different criteria. Three different games are included in the box – a family game, a solitaire game, and the full game. The family game removes only two elements from the full game, but until the English edition arrives is not one I'm about to attempt with my family. And I've heard very positive things about the solitaire game – even from those claiming to never play solo games – but this still has not tempted me to try it with one player. So what is in the full game, then? The basic structure is not dissimilar to Caylus – there are a number of choices of actions available, with more added throughout the game. But unlike Caylus, choosing actions is always free, and the actions are more varied as suggested by the number of scoring conditions. At the start of a two player game, there are ten choices available, plus one added at random for the first round. With more players, four or six additional choices are added, but they tend to be variations on the options available with two. Three of the choices are resources – wood, clay, and reeds. Two of the resources provide food – needed as a resource only on occasion, but required for each of six harvests over the course of the game. One action allows a player to plow a field. One action allows a player to collect one grain. One action allows a player to add rooms to their hut and to build stables. Two of the actions are special, and relate to the portions of the game which differentiate it from the family game. The first is the occupation space. Each player is dealt seven occupations at the start of the game, each providing a different ability. The final space has two functions; the first is to change the start player; unlike many games, the start play only changes when someone actively chooses to become the first player. The other function is to allow for the play of a minor improvement; as with the occupations, each player is dealt seven minor improvements at the start of the game. From there, one new action is added each round. Three of these are animals – sheep, boar, and cattle. One action allows for fences to be built, so that the animals can be kept. Two provide stone, an additional resource needed starting in the middle of the game. One provides vegetables, and two allow for fields to be sewn with either grain or vegetables, adding to a player's supply. Two allow for family growth, which in turn allow players more actions. One allows for major improvements to be built; these improvements generally allow for animals or vegetables to be converted into food, or provide a bonus at the end of the game for various resources. Finally, two allow players to renovate their huts, converting them from wood to clay, and later to stone. These actions are kept on three central game boards. Players each have their own separate game board for their farm as well, as well as five family member discs, 4 stables, and 15 fence segments. In addition, there are 138 wood discs representing the goods, 54 wood cubes representing the animals, and cardboard tiles for the huts, fields, and food. Each round, starting with the start player and continuing clockwise, players use their family members to perform actions, one choice at a time. Each action may only be chosen once, which provides an incentive for players to choose the start player action. The round ends as all players have used all of their family members. If it is not a harvest round, then play continues with the next round. Six of the rounds end with a harvest; players harvest a grain or vegetable from each field they have sewn, and then must feed their people. If a player does not have enough food, even after using all available techniques to get addition food, that player must beg for the missing food, suffering a major penalty at the end of the game as a result. At the end of the fourteenth round, each of the thirteen victory conditions is checked, and each player's score is totaled. The player with the highest total score wins. The real heart of the full game – and the only difference from the family game, in fact – is the occupations and the minor improvements. Occupations only take food in order to play, and tend to offer minor additional abilities – giving players an extra wood when taking wood, for example. Minor improvements are more expensive to play, usually taking multiple resources and often also requiring that a number of occupations have been played in advance. As a result, they tend to provide greater abilities – allowing players to plow three fields once instead of one, for example. Each of these decks is divided into three types – standard, interactive, and complex – each having different characteristics. Many have stated that Agricola feels like it contains the first two expansions already in the box, in no small part because the interactive and complex decks aren't needed in order to enjoy the game thoroughly; they can provide a pleasant change of pace, or be combined to add variety. While there are earlier games to have used similar mechanism, Caylus has really become the default comparison for games which offer a variety of actions, but only allow each action to be used once per turn. In Caylus, this always bothered me, as I felt this limitation in choices to be bothersome. In Agricola, I have found this to be less of an issue. I think there are two reasons behind this. First, I find that the actions in Agricola are more atomic – in Caylus, one often needs to complete many specific actions in order to complete a larger desired action, whereas in Agricola individual actions are more directly beneficial. Second, the actions available are known up front in Agricola; when an action is chosen, it's taken immediately, regardless of the actions of other players. It is still not my favorite mechanism – I prefer to have as many choices as possible – but it doesn't interfere so much with my enjoyment of the game. Agricola is not unique in the number of scoring methods, but it does penalize players for not making some effort to score in seven of the categories. This has the unfortunate effect, as players become more familiar with the game, of requiring players to take a fairly diverse approach. There's nothing wrong with this, but it does tend to make for more homogenous strategies rather than allowing players to ignore certain categories. There are still a variety of paths to victory, but I'd still prefer if the game didn't eliminate some possibilities. One component – fences – has another limitation I find annoying; players only have 15 fence segments each. With just a few more, players could emphasize this portion of the game more; it's all too easy to build all 15 segments. Most of the components in the game are specifically unlimited, and the limit on family size is actually a good choice for the game, but this feels like it forces things too much. "Multiplayer-solitaire" is often used as a negative description of a game, but I find it to be a useful designation, and one that's often an advantage from my point of view; I usually prefer games with indirect interaction to those allowing players to directly attack each other without restriction. Agricola works just fine for me as a result, but those who require direct interaction will likely be disappointed. The interactive decks do help some with this, but even they don't offer as much ability to impact other players as some gamers prefer. There is one occupation card, the ratcatcher – in the standard deck, oddly enough – which directly affects other players, not allowing them to use all their family members in all rounds. I found this to be most annoying, to the point that as soon as I learned of the card I removed it from my copy of the game. There's one other aspect of the game I've heard much grumbling about, even from fans of the game – while I'm willing to believe that the individual cards are well balanced, there are cards that work better together than others. I've seen suggestions of drafting mechanisms, either from a common pool or by giving each player extra cards and having them discard down to seven of each type. Personally, I'm not convinced this is needed – while there are definitely better combinations, I don't believe that it's usually enough to give the game to the player with the best cards. I have seen it happen, however, and the game is long enough that is will frustrate some players when it does occur; for some groups, a house rule will likely be needed. Having said all this, I do enjoy Agricola, and quite a bit at that. There's a lot going on – players always want to do more than they are allowed to do. This is, in fact, the biggest reason I've seen for some not to like the game – there's just too much to do, and having sorted through to a preferred set of actions having other players take them becomes too frustrating. For me, however, I find this to be a real advantage of the game – this flexibility makes for interesting choices. Agricola uses it mechanisms quite well to carry off the farming theme. The actions taken – plowing and sowing fields, building fences, collecting and breeding animals, and so on – are all central to agriculture. The only aspect that doesn't fit in nicely is the limitation that each action can only be completed once, but even this fit in with the concept that each of the actions requires tools, which are shared among the community. So there's only one post hole digger, for example, and so only one player can build fences each turn. The fit isn't perfect – some of the minor improvements should, logically, allow multiple players to take some of the actions – but at that level the balance is thrown to gameplay. The production of Agricola is very impressive in some ways – the cards are high quality, and there's an incredible amount of wood included, making for an extremely heavy box – but overall is more sufficient than exceptional. There's a _lot_ in the box; in addition to nine game boards and all of the wood and cardboard markers, there are 360 cards, including 166 occupations and 136 minor improvements. The artwork is well integrated, but there are nagging issues as well – I've often seen one or another resource run out, and some of the components are close enough in color as to allow for confusion. A workaround is included for the resources running, a small group of multiplication markers which replace all but one of a resource or animal, but we've found that it has sometimes lead to confusion in our games. Agricola is a game where one must assess their cards, and then formulate a strategy. There is no single path to victory in the game – one of its charms – and the cards one holds will often point out a primary direction. Having said that, there are a number of factors a player can keep in mind to do as well as possible. The most important fact to be kept in mind at the start of the game is that players have 28 actions to use over the course of the game. This limitation needs to be kept in mind when considering all actions. One of the most obvious considerations of this fact is that family growth can add actions. Since both additional family members _and_ additional rooms (provided they have been renovated) add victory points as well, this is a vital use of actions. The standard family growth occurs in rounds five, six, or seven; adding a room to your house before that point allows immediate use of the family growth space, often uncontested. And a new family member even in round seven adds seven actions, more than paying for itself. The family growth without additional rooms occurs in round twelve or thirteen, and while less valuable still more than pays for itself; it's worth taking the start player early in round eleven to guarantee the opportunity. In turn, this makes it worth saving a minor improvement to use late in the game. The second impact of the limited number of actions, and one that's often not realized initially, is that all occupations must be weighed relative to the one action they cost in order to play. There's a tendency to wish to play all occupations – they all offer some benefit, after all – but it's usually not correct to do so. With minor improvements, there are two consequences of the limited number of actions. The first is that it's rarely correct to play a minor improvement except in conjunction with some other activity – renovation, family growth, or occasionally start player. Second, given the resource cost, one needs to consider the action or actions needed to gain the resources when considering a minor improvement. I believe it's possible to do very well in the game without ever playing an occupation or minor improvement; the cost must always be weighed against the benefit. The third impact of the limited number of actions is that finding an efficient method to gain food is critical. Most often, this means buying a fireplace or cooking hearth, allowing animals to be converted into food. Sometimes it requires finding a method to convert resources such as wood or reeds to food. But taking two food at a time is almost certainly not the right choice; even with no family growth, it will take eleven actions to collect food. I've now played Agricola nine times, and I definitely enjoy the game. I've pre-ordered the English edition (from Z-Man Games), as there's a lot of text in the game, and while the pasted-up copy I own is very playable, it's not ideal. For those in groups without lots of German speakers, I would therefore recommend waiting for the English edition. As to the game itself, I would recommend it, with reservations. The number of choices – and the need to continually revise one's plans – will definitely detract from the game for some; even the "family game" has far more going on than in what most would consider to be a family game. In addition, those who can not tolerate card luck may well find the distribution of occupation and minor improvement cards a barrier to their enjoyment of the game. For those not overwhelmed with the choices, there is a very interesting and enjoyable game here. It's a longer game – expect it to take a couple of hours, plus a good half-hour to teach the first time. And it's an expensive game – the retail cost for the English edition is expected to be $70. But in my opinion, it's well worth it; the game is different enough and enjoyable enough that I expect to play it a fair amount, particularly when I receive an English copy. The fact that the game scales fairly well from two to five players helps quite a bit. On the whole, it's an impressive accomplishment for Uwe Rosenberg and Lookout Games; it will be fascinating to see what Lookout offers next.